Threading the needle is typically one of the earliest steps you do in any sewing or mending project, and using a needle threader makes it quicker and easier. A needle threader is usually faster and easier than threading needles using the "squint and poke method." The "squint and poke method" is exactly what it sounds like. You squint up your eyes to try to focus for a clear view of the needle's eye, then poke the thread end through the hole - sometimes it goes the first time - but if your vision isn't perfect and your hands are perfectly steady, it can take several tries. I actually do often use the "squint and poke" technique when I'm threading needles. It's how I learned to thread a needle when I was a kid, but my eyes aren't as clear as they were when I was a kid, and sometimes it takes several tries to get it. But, today I was rushing through, gathering my supplies to prep to film the video episode of Sewing Lesson From Stitching it Right, and I grabbed my needle threader to save some time. That's when it occurred to me that I should include a quick video about how to thread a needle using a needle threader. 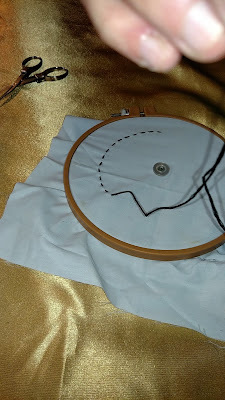 So, this post isn't very long, and the video is super short too, but knowing how to use a needle threader is really handy, and it can save you a lot of time and frustration when you need to thread a needle. 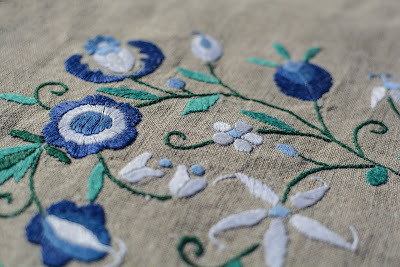 I love doing hand embroidery, so I'm really excited about bringing you this series of posts and videos about embroidery. Today's 'lesson' is about embroidery floss. My Grandmother taught me to do this type of handiwork at a young age, and that in itself provides a lot of memories that I'll always treasure. Every time I pick up an embroidery hoop and create something, I think of the time spent with Grandma, and I remember her voice telling me the tips I'm sharing with you in my videos and articles, and hopefully, someday you'll teach this style of creating to someone you care about. You can embroider so many things by hand. It's a great way to embellish clothing, textile things around the house, and even plush toys for young children or pets. 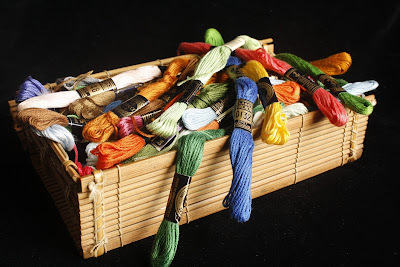 Embroidery floss for hand sewing is made up a series of fibers. Each strand is made of six strands, and each of the six strands is woven from two fibers twisted into a fine thread. You can use all six strands at once if you're trying to create a plush, thickly embroidered design, but there are advantages to splitting it. Most hand embroidery involves delicate stitches that can be overwhelmed by thick floss. You can split it into two or three strands, or even a single strand, but for most delicate designs, three strands are ideal. With three strands, you get enough plushness to give off a dramatic effect without it looking either sparse or overdone. The split fibers are also easier to pull through the fabric if you're embroidering on tightly woven fabric. 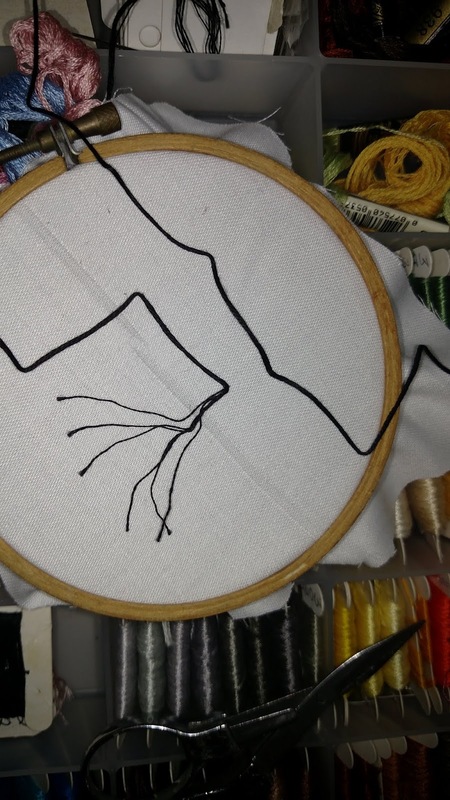 Cut the embroidery floss into sections about 12-18 inches long before splitting it. If you try to split a section that's too long, it ends up knotted. Longer sections also end up weakening your floss as it pulls through the fabric over and over. In the video below, I show a line of stitching made from six-strands and another made from three - so you can get an idea of the difference in appearance. 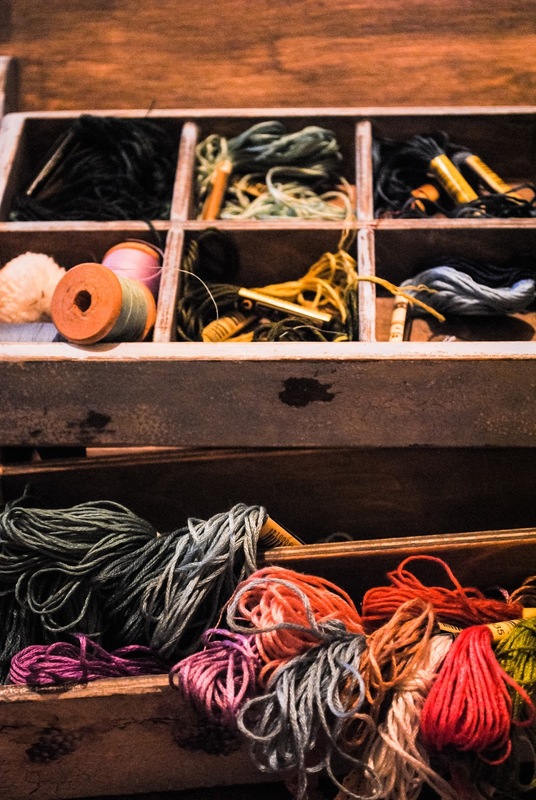 If you're working on a large project, try to get all the embroidery floss you need at once, and stick to the same brand, at least within each color to avoid ending up with unwanted variations in color or texture. 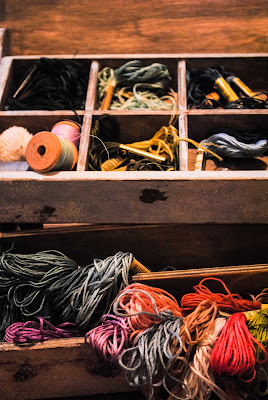 Make a note of the colors you're using, or keep the little band from the skeins of embroidery floss in case you need more floss - to increase your chance fo getting a perfect match. If you're trying to create special effects, look at some of the unique types of floss, like metallic, silk, pearlized cotton, or variegated color floss. Most hand embroidery floss is made of mercerized cotton, which gives it more strength and luster than unmercerized floss would have, and it can also be called stranded embroidery cotton thread, as noted by Sew Guide. Thanks for reading, and check out my Sewing Lessons From Stitching it Right videos on YouTube or visit the Stitching it Right Facebook page to join the conversation there. I just uploaded the second episode of Sewing Lessons From Stitching it Right to YouTube, and it's a basic list of things you need for hand sewing. Sewing by hand is relaxing and a great way to quickly mend something, and this episode of Sewing Lessons From Stitching it Right gives you a quick overview of some things you may want to pick up for your own hand sewing projects. The absolute must-haves are something fabric to sew, a needle, and thread, but there are also some things that can make the task easier. (Like scissors to neatly cut the thread, embroidery hoop to hold the fabric taut while you work, and sewing notions like hooks & eyes, buttons, and snaps. 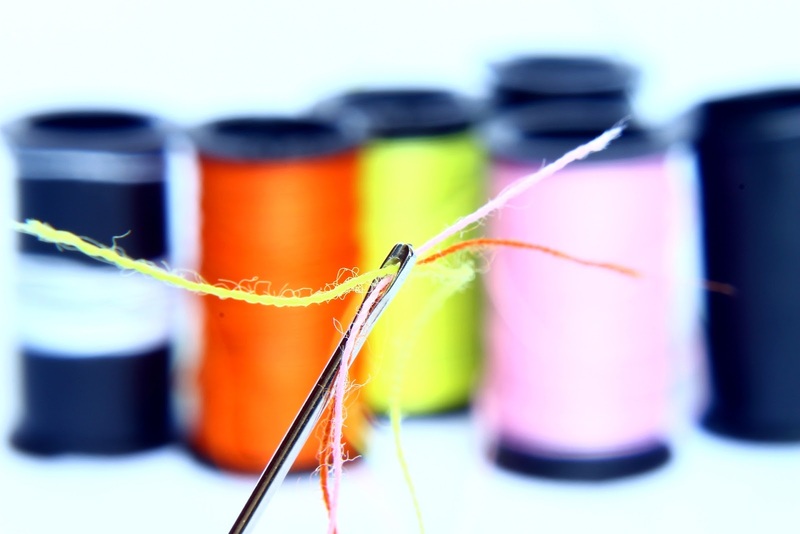 I would like to add a few tips for saving money on your sewing supplies. One way is to visit sites like eBay, which I added an ad for just above this, if I did it right. 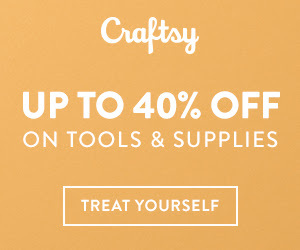 Search by lowest price or look for bulk lots of sewing supplies. Just be sure to compare prices to be sure you're getting the best deal. I also pick up a lot of vintage sewing supplies at yard sales and thrift shops. Buy your thread new, though, if possible. 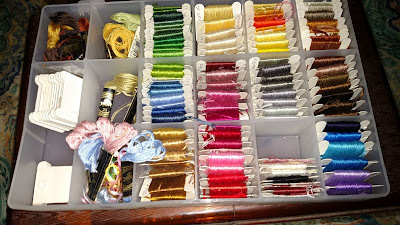 I recommend avoiding buying thread at those types of places simply because you don't know how old it is, and sewing thread gets weaker with age, and I would hate tsomethingehting just to see it come apart. If you check out the video and like it, be sure to click the little thumbs up icon and subscribe, and leave a comment if you want to because I would love to hear from you. I uploaded the first episode of Sewing Lessons from Stitching it Right to YouTube today, and I wanted to invite everyone who visits here to pop over and check it out. It's only 35 seconds long because I was kind of nervous, but I wanted to get this project started to help others learn to sew. Please, please, subscribe to the channel if you want to learn how to sew because there are so many great tutorials scheduled in our video publishing line-up. The episodes will cover hand sewing, hand embroidery, household sewing machine sewing, and industrial sewing techniques you can use when making your own projects - we'll also be bringing in some instructors to share info on machine embroidery and (hopefully) quilting. Also, if you have a particular technique you want to learn about, leave a note in the comments here or on the YouTube channel. We'll then bump that up in the publishing schedule so you can have the info you want as quickly as possible. A conversation about how I learned to sew was the inspiration for this channel. 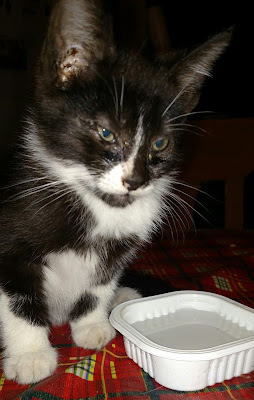 My best friend asked me how I learned to sew, and I told her about receiving a kit when I was three years old that contained a piece of burlap, some yarn, two huge plastic buttons, and a plastic needle - and how I stitched those buttons on that burlap, then removed the stitches and used it over and over again. I did that, literally, for hours and hours -- until my mother and grandmother started teaching me to sew other types of handcrafts. Then I did a beginner level sewing project using a sewing machine - for 4H - when I was in the fourth grade. She said she wished her mother or grandmother would have taught her to sew, but they didn't sew themselves... and it started me thinking how many people might benefit from having someone to show them some sewing techniques so they can make their own clothes, bags, home decor, or even car interiors. As an adult, I already had a strong understanding of sewing techniques due to learning how to sew as a child and enjoying sewing as a lifelong hobby... but I wanted to learn how to do custom upholstery work. So, I took an adult ed course in upholstery, which was great but didn't give me the experience I wanted in regard to customizing classic car interiors. So I signed up for a distance course in custom interior work that was supposedly created by George Barris, the Batmobile's creator. I got a lot out of the course and followed it with an apprenticeship with a local car interior shop before branching out and running my own little custom interior shop. It was a great course because it gave me background information on types of fabric and some sewing techniques that were new to me in spite of having years of experience under my belt at that point. Thanks for reading, and if you check out the video, I would love to hear what you think and what you would like me to cover next.